Petsy in miniature form. 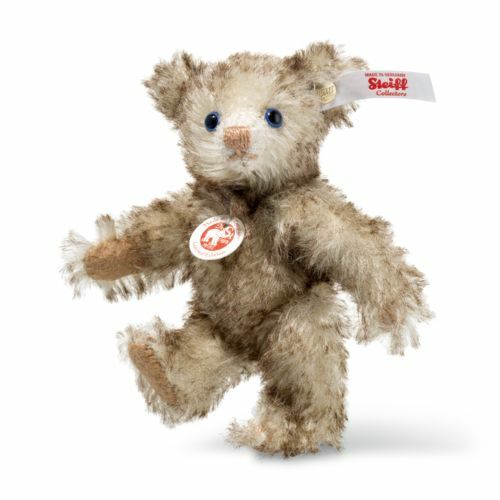 Baby bear Petsy hit the scene in 1928, his bright blue eyes and new facial expression establishing him as a top seller. Even so, Petsy only remained in the programme for two years. Many years later in 1984, one of the first fully jointed soft and cuddly Teddy bears was also given the name of the 1920s star. Last year, a replica of the 1928 Petsy was recreated in his original size and design. Measuring just 10 cm in height, the new miniature Petsy looks like this replica’s little brother. As you might expect, he comes with a coat of finest brown-tipped mohair, delicious blue eyes and a gold-plated Button in Ear.